For this project, my team and I decided to try and solve a problem that a lot of people share-buying something that is considered embarrassing from a store. So we created The Vault, a discrete vending machine. 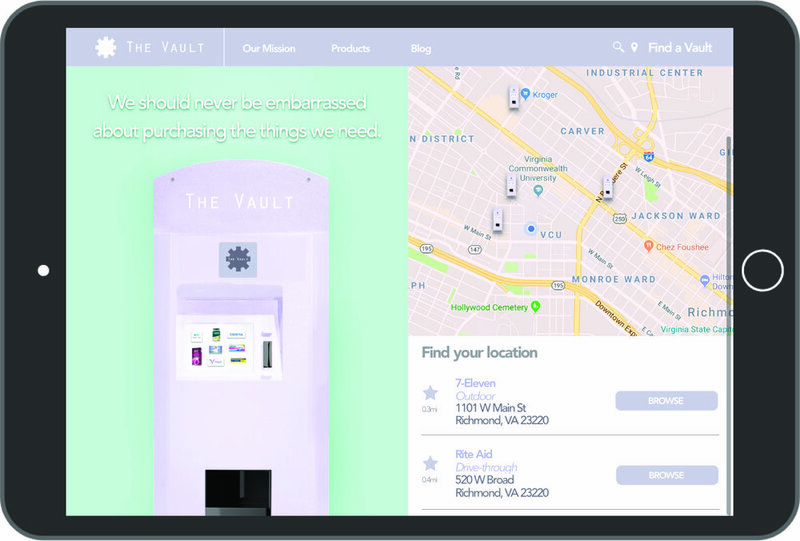 The goal of The Vault is to eliminate embarrassment and the stigma around buying products that may be considered “shameful”. But until then, we want to provide the easiest and most comfortable way of obtaining these products in a society where judgement is often passed. Because of shame associated to purchasing certain goods, a lot of times buying certain essentials is neglected. We think that by starting to raise awareness we can slowly begin to change the way people perceive these products and help people feel empowered by taking care of their own needs. We focus on the immediacy aspect of purchasing these goods-yes you can probably purchase most, if not all, online, but even with the fastest delivery, that takes at least a few hours. In order to keep it as private as possible, the vending machine has a universal package for all of the products it offers, and is located in places that are open to everybody to access but also hidden enough that people can't see it-for example, around the corner from 7-eleven, or a drive through at Rite-Aid. I created a website to make it accessible to all people, even those who may not have smart phones and use applications. More details coming soon.